Constantin Brunner (1862–1937) is one of the philosophical authors whose work remains to be discovered. On the occasion of his 150th birthday and the 75th anniversary of his death, the Jewish Museum hosted a conference that traced the whole range of his thought and personality. The German Jewish philosopher, pen-named Brunner while originally named Leo Wertheimer, was born in Altona outside of Hamburg. 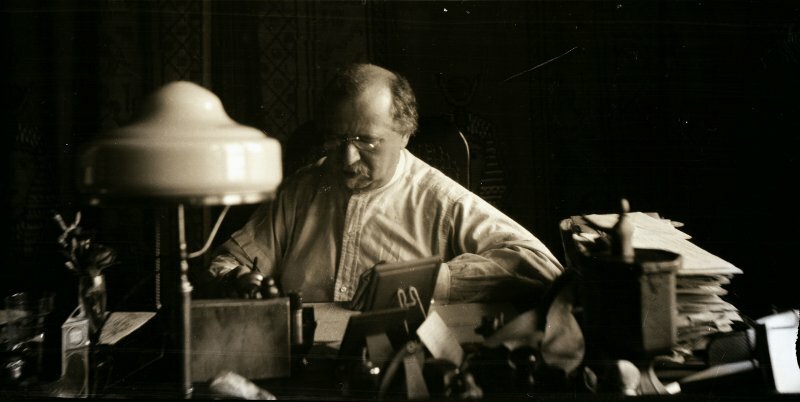 He studied religion, philosophy, and history in Cologne, Berlin, and Freiburg, and subsequently lived and worked in Hamburg as an editor and writer, until devoting himself to the development of his own philosophical system, starting in 1895 in Berlin and then from 1913 in Potsdam. His magnum opus was published in 1908, entitled Die Lehre von den Geistigen und vom Volk (The Teachings of Intellectuals and of the People). Beginning in 1911 Brunner additionally worked on defining his position in opposition both to Zionism and to anti-Semitism. He made frequent comments in books and essays on the “Jewish question” (e.g. in 1918 in Der Judenhaß und die Juden, (The Hatred of Jews and the Jews), and in 1930 in Von den Pflichten der Juden und von den Pflichten des Staates, (On the Obligations of Jews and on the Obligations of States). At the same time he worked on a spiritual philosophy (e.g. in 1921 in Unser Christus oder das Wesen des Genies, (Our Christ or the Essence of the Genius), and in 1928 in Materialismus und Idealismus). In 1933 he went into exile in Holland at The Hague, where he died in 1937. An understanding of Brunner’s life, work, and influence has long been nurtured in the circle of his friends and followers. Due to his strident personality, his philosophical pathos, his stinging cultural critique, and his uncomfortable political views, Brunner has remained in the background of cultural and philosophical discourse. Recently however, his work and personality have awoken new interest, inspiring a desirably more fundamental treatment of his philosophy. The starting point for the conference was the online publication of the Constantin Brunner Collection, the largest legacy of the Leo Baeck Institute. The accessibility of his work online has enabled readers to gain deeper insight into Brunner’s life and work and also into the circle around him. Another impetus for the conference was the publication of a selection of his letters by Wallstein Verlag, which has rendered him clearly distinguishable as a thinker in his historical context. Significant letters were chosen from among those in the book and were offered in a reading for participants of the conference by actor Hanns Zischler. The contributors to the conference traced in their talks the central themes of Brunner’s work, discussing them in a contemporary context: for instance the early Brunner’s critique of modernism and art theory in his journal, Der Zuschauer (The Spectator), his understanding of spiritual and cultural history, his binary differentiation of intellectuals and the people, his Spinozism, as well as his patriotism, his anti-Zionism, his critique of anti-Semitism, and his insistence on assimilation. Further, the contemporary reception of Brunner was explored in exemplary fashion: the encounters Brunner had with Lou Andreas-Salomé as well as with Rose Ausländer, who belonged to the Brunner circle around Friedrich Kettner in Czernowitz. Brunner’s critique of religion was addressed with respect to the reception of Eckhart in Brunner’s book on Christ, and others discussed the domestic environment as well as the rhetoric of philosophers. The conference showed overall that Brunner was an independent and engaged thinker who wrote with great personal involvement. Some of his conclusions anticipate later achievements. Through a reconsideration of the contexts in which his thinking arose, the participants indeed showed that Brunner was not, or was not always, a solitary intellectual, despite his occasional appearance to that effect: to some extent he can be comprehended out of the contemporary discourse and he involved himself in it, even when he didn’t allow this to be entirely visible. The conference was only able to cover a few aspects of Brunner’s thinking. It became clear that his complex oeuvre cannot be conclusively evaluated through an only partial treatment. Many questions were raised that will need to be addressed by further research. The papers given at the conference will be published in an edited volume in 2013.